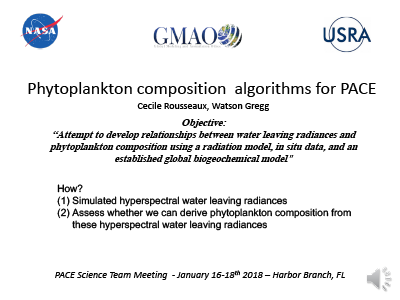 We propose to develop an algorithm to derive phytoplankton composition using a radiation model that provides hyperspectral data similar to what we expect from the PACE mission. Because there has not been any previous global mission with similar capabilities, there is a need for assessing the best approaches and anticipate potential problems if we are to get the most information out of this mission. 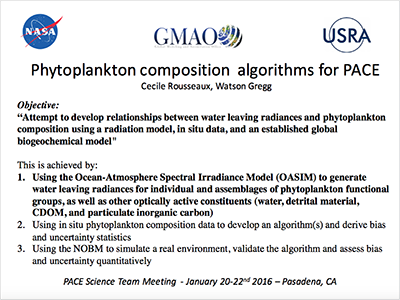 Here we propose to use the Ocean-Atmosphere Spectral Irradiance Model (OASIM) to derive the total water-leaving radiance of single and mixed phytoplankton functional groups. 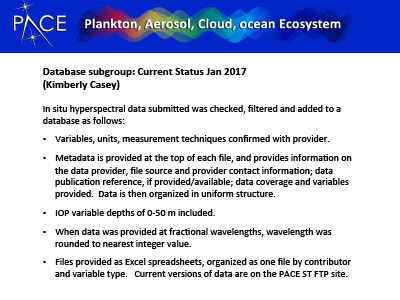 We will then use an extensive dataset to develop an algorithm or algorithms to derive phytoplankton composition from these hyperspectral data. 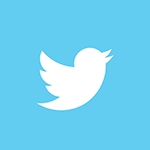 We will test this algorithm against in situ data that were withheld from the algorithm development. 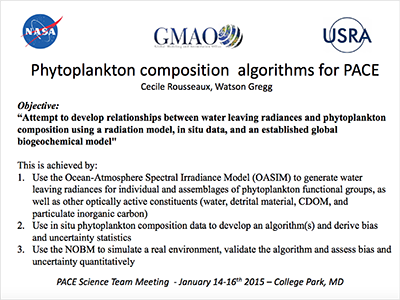 Finally we will apply this algorithm to a state-of-the-art biogeochemical model (NASA Ocean Biogeochemical Model) that has been shown to represent reasonably well the global distribution of phytoplankton composition. 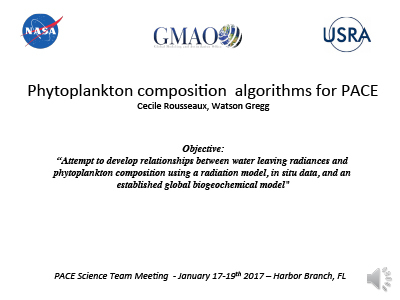 Using this model, we will assess how well this newly developed algorithm does in representing the natural global distribution of phytoplankton groups. Comprehensive quantitative error and uncertainty analysis will be integral in each of the stages of the proposal. Additionally, we propose simulations to test different configurations of the sensor to understand the capabilities and limitations associated with engineering options. Although we acknowledge that there may be formidable challenges throughout these steps, we believe that we can learn some valuable information from these challenges. *Rousseaux, C.S., and Gregg, W.W. (2017). Forecasting Ocean Chlorophyll in the Equatorial Pacific, Frontiers in Mar. Sci., 4, 236, doi:10.3389/fmars.2017.00236. *Gregg, W.W., Rousseaux, C.S., and Franz, B.A. (2017). Global Trends in Ocean Phytoplankton: A New Assessment Using Revised Ocean Colour Data, Remote Sens. Lett., 8 (12), 1102-1111. doi:10.1080/2150704X.2017.1354263. Gregg, W.W., and Rousseaux, C.S. (2017). Simulating PACE Ocean Global Radiances, Front. Mar. Sci., 4 (60), doi: 10.3389/fmars.2017.00060. Gregg, W.W., and Rousseaux, C.S. (2016). Directional and Spectral Irradiance in Ocean Models: Effects on Simulated Global Phytoplankton, Nutrients, and Primary Production, Front. Mar. Sci. 3 (240), doi:10.3389/fmars.2016.00240. Rousseaux, C.S. and Gregg, W.W. (2015). Recent Decadal Trends in Global Phytoplankton Composition, Global Biogeochem. Cycles, 29, 1674-1688, doi: 10.1002/2015GB005139. Blakey, T., Melesse, A.M., and C. S. Rousseaux, C.S. (2015). Toward Connecting Subtropical Algal Blooms to Freshwater Nutrient Sources Using a Long-Term, Spatially Distributed, In Situ Chlorophyll-A Record, Catena, 133, 119-127, doi: 10.1016/j.catena.2015.05.001. Thompson, P.A., Bonham, P., Thomson, P., Rochester, W., Doblin, M.A., Waite, A.M., Richardson, A., and Rousseaux, C.S. (2015). Climate Variability Drives Plankton Community Composition Changes: The 2010-2011 El Niño to La Niña Transition Around Australia, J. Plankton Res., 37(5), 966-984, doi: 10.1093/plankt/fbv069. 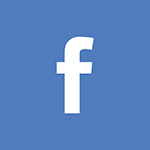 Ott, L.E., Pawson, S., Collatz, G.J., Gregg, W.W., Menemenlis, D., Brix, H., Rousseaux, C.S., Bowman, K.W., Liu, J., Eldering, A., Gunson, M.R., and Kawa, S.R. (2015). Assessing the Magnitude Of CO2 Flux Uncertainty in Atmospheric CO2 Records Using Products from NASA's Carbon Monitoring Flux Pilot Project, J. Geophys. Res. Atmos., 120, 734-765, doi: 10.1002/2014JD022411. Rousseaux, C.S. and Gregg, W.W. (2014). The Power of Three [in Beyond 9 Billion], International Innovation, 155, 106-108. Gregg, W.W. and Rousseaux, C.S. (2014). Decadal Trends in Global Pelagic Ocean Chlorophyll: A New Assessment Integrating Multiple Satellites, In Situ Data, and Models, J. Geophys. Res., 119 (9), 5921-5933, doi: 10.1002/2014JC010158. Gregg, W.W., Casey, N.W., and Rousseaux, C.S. (2014). Sensitivity of Simulated Global Ocean Carbon Flux Estimates to Forcing by Reanalysis Products, Ocean Model., 80, 24-35, doi: 10.1016/j.ocemod.2014.05.002. Rousseaux, C.S. and Gregg, W.W. (2014). The Effects of Chlorophyll Assimilation on Carbon Fluxes in a Global Biogeochemical Model, NASA Technical Report Series on Global Modeling and Data Assimilation (K.D. Koster, ed. ), 33, 22 pp. Rousseaux, C.S. and Gregg, W.W. (2013). Interannual Variation in Phytoplankton Primary Production at A Global Scale, Remote Sens., 6(1), 1-19, doi: 10.3390/rs6010001. Gregg, W.W., Casey, N.W., and Rousseaux, C.S. (2013). Global Surface Ocean Carbon Estimates in a Model Forced by MERRA, NASA Global Modeling and Assimilation Series (M. Suarez, ed. ), NASA Technical Memorandum 2012-104606, 31, 32 pp. Rousseaux, C.S., Hirata, T., and Gregg, W.W. (2013). Satellite Views of Global Phytoplankton Community Distributions Using an Empirical Algorithm and a Numerical Model, Biogeosciences Discuss., 10(1), 1083-1109, doi: 10.5194/bgd-10-1083-2013. Rousseaux, C.S. and Gregg, W.W. (2012). 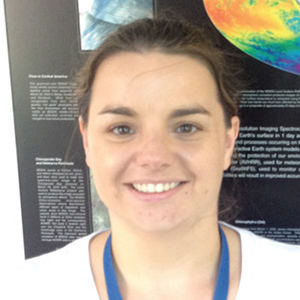 Climate Variability and Phytoplankton Composition in the Pacific Ocean, J. Geophys. Res., 117(C10), C10006, doi: 10.1029/2012JC008083. Wernberg, T., Smale, D.A., Tuya, F., Thomsen, M.S., Langlois, T.J., de Bettignies, T., Bennett, S. and Rousseaux, C.S. (2012). An Extreme Climatic Event Alters Marine Ecosystem Structure in a Global Biodiversity Hotspot, Nature Climate Change, 3(1), 78-82, doi: 10.1038/nclimate1627. Rousseaux, C.S., Lowe, R., Feng, M., Waite, A.M., and Thompson, P.A. (2012). The Role of the Leeuwin Current and Mixed Layer Depth on the Autumn Phytoplankton Bloom Off Ningaloo Reef, Western Australia, Cont. Shelf Res., 32, 22-35, doi: 10.1016/j.csr.2011.10.010. Langlois, T.J., Radford, B.T., Van Niel, K.P., Meeuwig, J.J., Pearce, A.F., Rousseaux, C.S.G., Kendrick, G.A. and Harvey, E.S. (2011). Consistent Abundance Distributions of Marine Fishes in an Old, Climatically Buffered, Infertile Seascape, Global Ecol. Biogeogr., 21(9), 886-897, doi: 10.1111/j.1466-8238.2011.00734.x.